Contrary to general public opinion, misinformed by a local indicator and countless websites, the world's highest motorable road pass is NOT the "5682m" or "5602m" Khardung La, NE of Leh in the Indian Himalaya. A Catalan research expedition accurately measured this at 5359m. For further evidence of this, from other travellers who have measured it with GPS, and other reliable sources, see an August 2012 trip report and Wikipedia. The true identity and location of the highest motorable pass depends on how "motorable pass" is defined. Is it defined as a pass over which it is possible for an expert driver to drive a suitably adapted motor vehicle, or a pass which can be driven by an average driver in an average car? There is surely a higher motorable pass than Khardung La, by any definition, at Suge La, 100km west of Lhasa. See this summitpost page by Janne Corax, who knows this area well, on which it is clearly shown that this pass is on a bus route. The elevation shown on the map on the above page, 5430m, is supported by both GPS and SRTM. A road from Raka (Raga) to Tsochen (Coqen), through the Trans-Himalayas, rises to 5565m at Semo La, N 30�06'36" E 85�25'54". Janne Corax writes that "the LONG distance bus lhasa-shiquanhe/ali takes this road once a week, at least it did until the southern route (saga-paryang-shiquanhe) was upgraded", and that "minibuses, trucks, landcruisers and sometimes even 'normal cars' travel here". But, compared with Khardung La, this is a very remote area. See this summit photograph supplied by the Catalan cycle tour and their GPS report. See also here Janne's photographs from Semo La. He writes that "001 is from the pass, with a car, showing the road; 002 is from a little side road at the pass, included because it's easy to tell it is Semo pass, for those who have been there; 003 is on the way down on the north side of the pass, a heavily loaded truck, just to show what kind of vehicles travel the road." 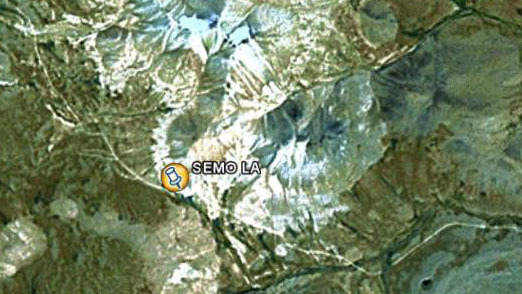 Satellite images from Google Earth and NASA World Wind clearly show the Semo La road. Processed GPS readings for Semo La can be downloadeded here. There may be a higher pass at Marsimik La, India, at N 34�05'36" E 78�37'06". This report gives its elevation as "5590m/18634feet", but 5590m is 18340 feet. SRTM gives an elevation of 5582m. The road may be motorable by skilled riders on powerful motorcycles, and by Indian army jeeps, but I doubt if it is motorable in the sense that most drivers and vehicles could consider it motorable. An alternatve candidate may be Lo La. According to Martin Adserballe, who cycled over it in September 2006, the main pass "is situated at N 29�54'569 E 86�42'427. The pass itself was 5578 meters according to GPS. There were two parallel roads leading up to the roadpass - one constructed with the pass as summit and one going over a small hill before the pass - reaching an altitude of 5593 meters." Martin also claims that it would be possible to drive a car over this pass; it is unlikely that such a claim could be made about Marsimik. Here are some photographs, uploaded with his permission: 1 2 3 4. 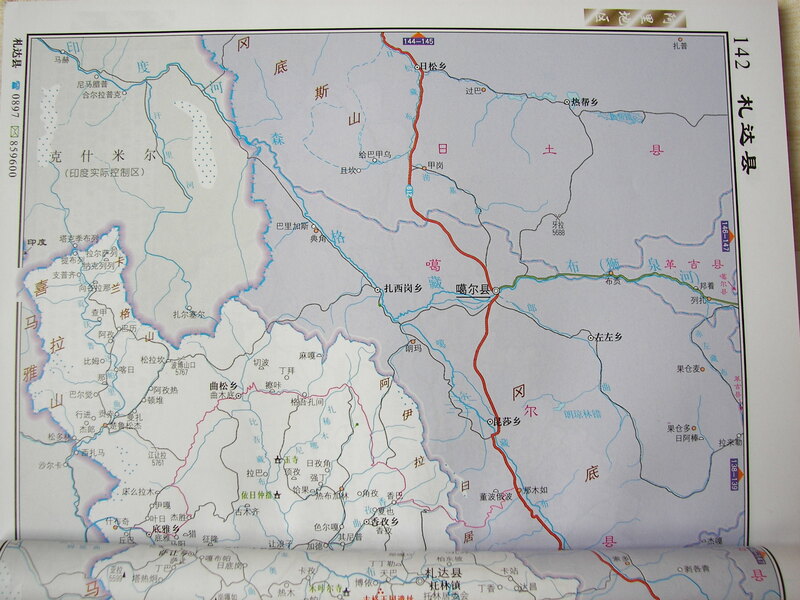 Roads shown on Tibetan road maps suggest there may be even higher motorable passes, but it is not clear that the passes shown are motorable. More information about these is needed. Two passes, Bodpo La, 5767m at N 32�19' E 78�59', and Jang Rang La, 5761m at N 32�03' E 78�53', are shown on a Tibet road map. According to a Chinese source, a jeep has been driven up one of these passes, probably Jang Rang La; if you can read Chinese, see here and here. Local sources say that although the roads are small, a "friend of a local guide" said that he had been over them. Whether or not they are motorable through roads is still not clear. Unfortunately access to the area for non-Chinese nationals is very difficult and may be impossible. In June 2011 it was drawn to my attention that Chinese explorers had cycled over a 5830m pass "Lajiong La" at 30�08'22" 85�06'25". The second photograph from the top shows two trucks using this pass. Suggestions that there may be an even higher motorable pass over the Nyainqentanghla at Gorun La, 5910m at N 30�17' E 90�15', can be discounted. I thank Janne Corax of Sweden, Martin Adserballe of Denmark and Tang Zhengliang of Nanking, China for the above information. A unpaved road, reported here (in Italian), rises up Cerro Uturunco, in Bolivia, to 5836 m at S 22�15.484' W 67�10.680'. But according to Dr Steve Pells of the Edinburgh Roslin Institute, who cycled (or pushed his bicycle in some places) up this road in 2005, "the road is blocked to motor vehicles from about 5550 m by a landslide that occurred a few years ago", and although there is a 5,760m "pass" between Uturunco's two summits, it is a cul-de-sac that leads only to a mine. Still, a French team evidently managed to cycle and/or push their bicycles to Uturunco's 6020m summit. On 6 April 2010 German cyclists reached 6085m on Ojos del Salado. Sulphur mine workings at 6,000m on the north side of Aucanquilcha, in Northern Chile, have been serviced by motor vehicles. The road was constructed all the way to the 6,195 metre summit, which was reached on bicycle by Martin Adserballe (see above) in August 2009. He reported that due to landslides, motorised use is no longer possible and cycles cannot be ridden along some stretches. At 5334m, a nearby village of the same name is the world's highest permanent settlement. It is claimed here that, in 2007, a Jeep Wrangler was driven off road up to the crater rim of the world's highest volcano, Ojos del Salado, reaching an altitude 6646m, 247m below the volcano's highest point (6,893m). A few weeks later it was claimed that Chileans had driven another specially adapted vehicle even higher up this route, to 6688m, see here and here. Although there is nothing that could be called a road there, I have been told that it is not unusual for local rangers to drive 4x4 vehicles up Ojos del Salado to 5900m. Information collated by Jonathan de Ferranti. Last update 27 July 2011.